Question 1) I am applying a patch using adpatch , can I open another session and run adadmin ? Question 2) I am applying a patch , can I open another session in another node and run adpatch? Question 3) How to determine Oracle Apps Version ? Question 4) How u will find whether a patch is applied/not? Question 5) What is the difference between ad_bugs and ad_applied_patches? Answer A patch can deliver solution for more than one bug, so ad_applied_patches may not give u the perfect information as in case of ad_bugs. Question 6) What is FNDLOAD ? Question 7) What is autoconfig? Answer Autoconfig is an ad-utility which is used to maintain application environment and configuration files. Question 8) What are the parameter autoconfig will ask for? Question 9) What is context file? Question 10) How autoconfig will create environment and configuration files? Question 11) In how many phases autoconfig will run? Answer Autoconfig will run in 3 phases. Question 12) What is the location of ad-config log file? Question 13) Is it possible to restore a autoconfig run? Answer Adconfig will create a restore.sh script at $APPL_TOP/admin//out/. This restore.sh will copy the backed up files before autoconfig run to its original locations. But the profile values updated in the database can’t be restored back. Question 14) How to clear cache in R12? Question 15) When a patch delivers java files what extra file you will get when you unzip the patch, other then u driver and readme files? Question 16) What is apps.zip/appsbrog2.zip file? Question 17) What is the location of apps.zip/appsbrog2.zip? Question 18) How to find Multi-Org is enabled or not? Answer In adadmin if covert to Multi org option is there, then Multi-org is not enabled. If maintain multi-org options is there, then Multi-org is enabled. Question 19) What is Multi-Org? Answer If this is enabled we can store multiple organization information in a single oracle application instance. Question 20) What is adodfcmp utility? Answer This utility is used to recreate/repair corrupted database objects from odf (object definition files) files. Question 21) How you will change apps password? Question 22) What if apps password is changed with alter command? Question 23) What is the difference between alter and FNDCPASS in changing apps password? Answer FNDCPASS will update some fnd tables like FND_ORACLE_USERID, FND_USERS other than standard tables. Question 24) How to find the version of httpd/Apache web server? Question 25) Where you will see when you have some problem with u r web server(httpd/Apache)? Question 26) What is self service application? Answer Whatever part of u r oracle application u r able to see through web browser is self service. Question 27) What are the different modes u can start u r form server? Question 28) What is the significance of DISPLAY variable? Answer Vnc server should be up and running at the specified port value in DISPLAY variable, otherwise report server may not able to show the graphics in Reports. Question 29) Where is the concurrent manager log file located? 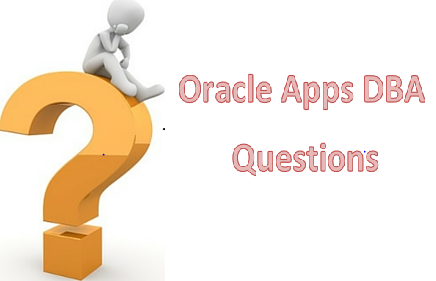 Question 30) Is apps password necessary to start all the components of oracle application? Answer No. Only to start/stop concurrent managers apps password is needed. Question 31) What is a concurrent manager? Answer A concurrent manager is one which runs concurrent requests. Question 32) What are the different types of concurrent managers? Question 33) What are actual and target count in ‘Administer Concurrent Managers form’? Answer Target is the no. of concurrent processes a manager is supposed to start(specified in the definition of concurrent manager).Actual is the no. of processes a manager started actually. Question 34) What if Target and Actual are not same? Answer It means at operating system level resources are low to accommodate the required processes for concurrent managers. Question 35) What are work shifts? Answer Work shifts are nothing but timings at which the concurrent manager is supposed to run. Question 36) What if internal concurrent manager target and actual are not same? Question 37) How to bounce a single concurrent manager? Answer From front end using ‘Administer Concurrent Manager form’. Question 38) What is dbc file and its location? Question 39) What is RRA? Answer RRA stands for Report Review Agent. RRA is nothing but FNDFS which is part of apps listener. RRA job is to pick the log/out file from the file system and show on the editor when u press view log/out button in ‘View concurrent request form’. Question 40) What is apps listener? Answer Apps listener is the combination of FNDFS and FNDSM. FNDSM is service manager which will monitor application services on that node when GSM:enable profile value is ‘Y’. Question 41) What is GSM? Answer GSM stands for Generic service Manager, which will monitor application processes like web, forms etc and restarts any of this processes if goes down. Question 42) How to find out what are the languages enabled in u r applications? Question 43) What are the problems u have faced while shutting down applications? Answer While shutting down application generally concurrent manager won’t go down because some or the other request may be running. We will see what are the concurrent requests running by querying fnd_concurrent_requests, fnd_concurrent_program_vl, v$session,v$process and v$sqltext. If that request is only doing some select statement then we will kill those requests, otherwise we will check what time it will take to complete by querying the previous runs of that request and then we will decide what to do. Question 44) What is rapid clone? Question 45) Explain the cloning process? Question 46. What is licence manager? Answer Licence manager(adlicmgr) utility is used to licence/unlicence , enable new languages,enable country specific functionality. Question 47. What is tnsping? Answer tnsping is command used to check the connectivity to the database server node from other nodes. Question 48: How to compile a form using frmcmp or frmcmp_batch? Question 49) What is APPLPTMP environment variable? Answer This is the temporary file location for the pl/sql temp files. If this variable was not set then the concurrent programs may error-ed out. Question 50 What is mean by enabling maintenance mode? Answer Maintenance mode is the adadmin option introduced from AD.I. When maintenance mode is enabled user may able to login to application but they only get profile option in the front end navigation menu. Question 51) Is that necessary to enable maintenance mode while applying a patch? Question 52) What is the significance of utl_file_dir parameter in init.ora file? Answer The value of this parameter is the group of directories to which your database can write, means your database packages have permission to write to flat files in these directories. Question 53 How you will find workflow version? Question 54) How to validate that any application user password is correct or not from back-end? Question 55) How to compile jsp’s? Question 56) What are the files which contain apps password in R12? Question 56) What is the script to find out ICM status? Question 57) What is the script to list the concurrent request status? Question 58) What is the script that Lists managers that currently are running a request? Question 59) How can I determine whether a template is customizable or non-customizable in Autoconfig? Answer If a keyword “LOCK” is present at the end of the file entry in the respective driver, then it is a non-customizable template. If the “LOCK” keyword is not seen, then that template can be customized. Question 60) How to check whether the product is install,shared and Not installed in Apps.? Answer By using below Query we can find. Oracle DBA All-in-one Scripts – A guide every DBA must have: Oracle dba scripts collection used by expert database administrators everyday. Must have dba scripts for your daily activities! Nice effort, Great serve for us.